Before I buy new, looking to see if anyone has any of these parts for my '72 Pre-L.
2) An original metal radio delete plate. One with chrome sides and panther. 4) Euro front grill T emblem. I know it's not orginal to my car, but like the look. You should know the amber lense is the same on both sides, but the buckets are corner specific. The buckets are designed so the lens sits parallel with the center of the car, and because the curvature of front and rear fenders varies from corner to corner each bucket is different. I know of one vendor who reproduced the buckets but only made two types and he told me that there were only two types from the factory. He is wrong. Now, kitty corner buckets will interchange, they are close matches, but they are not the same and will not hold the lenses parallel to the centerline. Not that anyone would ever notice. Do you need just the light or the assembly? Do you have the old one intact just missing a mounting stud? There are 2 tones of yellow. I have a quick removal steering wheel assembly but do not remember the make. will look. Dome light lens only, lens with bezel or the entire assembly? Thanks for the info about the side markers. I honestly didn't realize there were different tones or housings. I think I need just the lens. 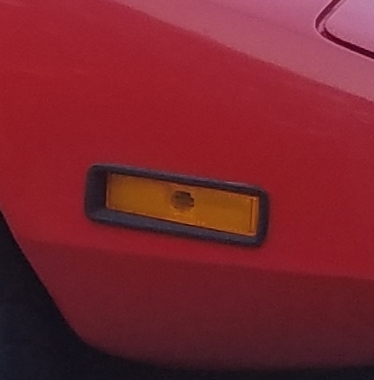 The prior owner has a red lens on the driver side and an amber on the passenger side. Here's a picture of the one amber one installed. Not sure if the housing is correct or not. If not, I would want the correct ones. My dome light works, but the lens is cracked for sure. Not sure about the bezel though, I'll look closely again and let you know. Here is a picture of Wilkinson's quick release. I really like this setup with the black center and T script if anyone has one. I fell flat on everything, sorry. It is getting much harder to find original parts. 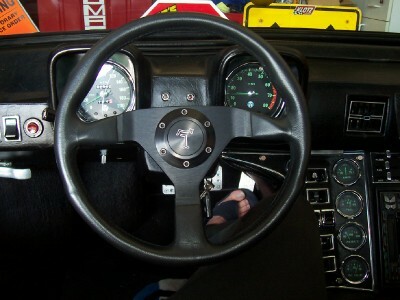 The steering wheel quick release assembly is a Lecarra with the original looking blue/white emblem. Steve's is very nice. As far as I know the original radio delete plate was always plastic, with a chromed edge/center rib. I have one in the garage somewhere. Kirk - Thanks for looking . Just a few parts I thought might be easy to find used. I'll keep checking around. Joules- I see the plastic repo ones on ebay, but thought there were different original plastic or metal versions. Always learning something here. If you find it, let me know if your interested in letting it go. Thanks. Early 71 panteras had metal delete plates. At one time I had 3. Nothing now. I have a orange side lens on eBay now if you need one and a dome light. Thanks for confirming the metal delete plate. I couldn't remember for sure where I heard about them, but I am interested in one. I'LL check your ebay listings for the other parts.